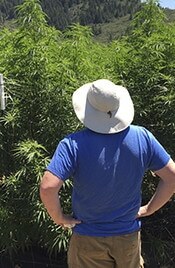 Little Hill Cultivators is an award winning organic cannabis farm located in Northern California’s Emerald Triangle. Little Hill Cultivators specializes in light dep greenhouse flowers utilizing the sun for both full spectrum plant growth and powering fans reducing their carbon footprint. The strains they are known for include many OG Kush hybrids and selections from CSI: Humboldt and Archive Seed Bank. On this episode of The Real Dirt, Chip sits down with Jefe from Little Hill Cultivators to discuss all things cannabis cultivation in the state of California. Jefe is a master cultivator, winner of multiple cannabis cups around the state of California, and his green houses are solar powered! Fire it up with Chip and Jeff, as they discuss growing cannabis and much more.